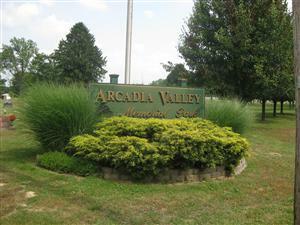 Directions: This tour stop [ Waypoint = N37 35.648 W90 37.245 ] is located near the entrance to the Arcadia Valley Memorial Park cemetery. From the Russellville Picket tour stop, travel about 0.4 miles down Russellville Road and turn right onto Cemetery Road. "When I reached the ford of the creek above Ironton in the gap between Shepherd Mountain and Pilot Knob Mountain I met a detachment of some eighty or more of the 3rd M. S. M. Cavalry, and the commander at once halted and asked an explanation. My explanation was the same as before,”Rebels coming!” I added, however, that he could ride back to post headquarters and hear my report; which he did, leaving his men halted in the road. "[A short time later I heard] the guns were popping down in Ironton like pop-corn in a hot skillet. Company E, of the Forty-seventh and the Third M. S. M. boys were having a hot time down there. Soon the Fourteenth Iowa Infantry, one section of Captain Montgomery's battery, and more of the Third M. S. M. Cavalry, under Major Wilson, were on the double-quick and trot for the scene of action, and in a short time the boom of Montgomery's guns told us that they had struck game. Our boys soon drove the Confederates down the 'Shut-in' on Stout's Creek, about two and a quarter miles east of Ironton. But, night coming on, the firing down there ceased and we drank our coffee and ate fried pickled pork and hardtack for supper and then lay down on the east bank of the south rifle-pit to await the coming of the battle of Pilot Knob next day." "On reaching Pilot Knob at noon of Monday, September 26, I found scouting parties had been sent the night before on all the main roads, but that the party sent toward Fredericktown had returned after going but six or eight miles. I forthwith sent two companies to make a thorough reconnaissance toward Fredericktown, and a small scouting party under Captain Powers to cross the roads leading from the south to that place, and learn of the loyal people on them as much as possible as to the force of the enemy. 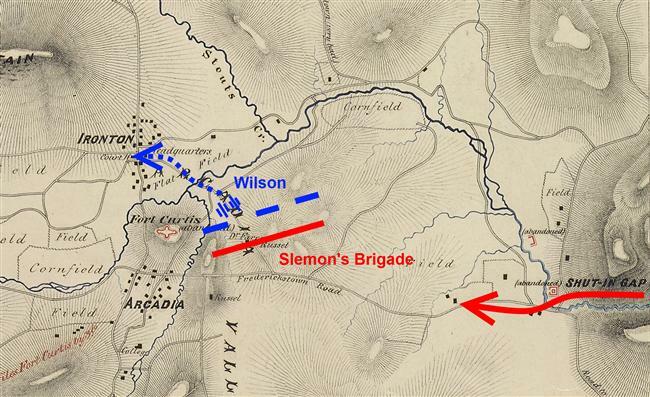 Both commands met Price's advance in Arcadia Valley, near Shut-in Gap, and were forced back into the town of Ironton, where, with Captain Dinger's company, Forty- seventh Missouri, then on duty there, they made a stand. 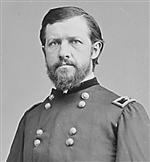 I re-enforced them with the detachment of the Fourteenth Iowa, Captain Campbell commanding, and a section of Montgomery's battery, Lieutenant Simonton commanding, and all my available cavalry, placing the whole under command of Major Wilson, with orders to drive the enemy, if possible, through Shut-in Gap. He drove them to the gap, but was unable to hold them there, and was being forced back gradually when night and a rain-storm suspended the engagement."